Puppies, just like babies, need to be taught new things. However, it isn't always easy to do that. 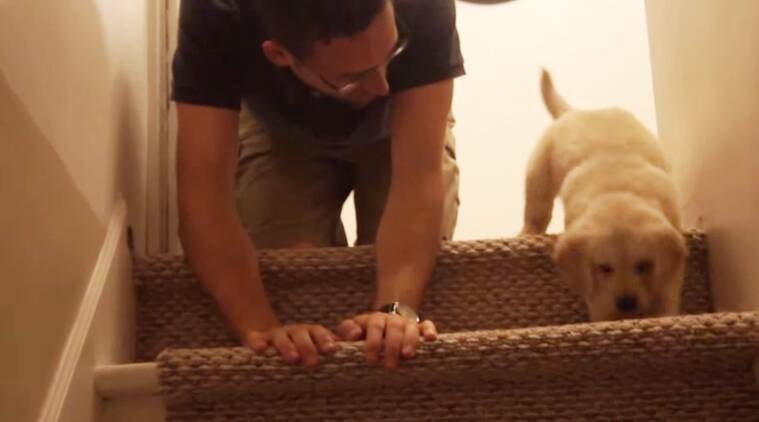 Watch this video of a human-dad trying to teach a pup how to climb down the 'scary' staircase. Bringing a pet home often feels like having a newborn baby. Not only do they need utmost care and attention, the pet-parents need to be extra cautious and pry on them from time to time. From potty training to playing outdoors, a new pet needs to be taught everything. This man shared an adorable clip as he taught the little one how to go down the “scary” staircase. When the ‘nervous’ pup looked way too scared, his human-dad decided to help him out and climbed down ‘one step at a time’ along with it. The viral clip, which goes on for over 2 minutes, is an overdose of cuteness and by the end of it, you’ll end up saying ‘awwwww’. What did you think about this video? Tell us in the comments below.